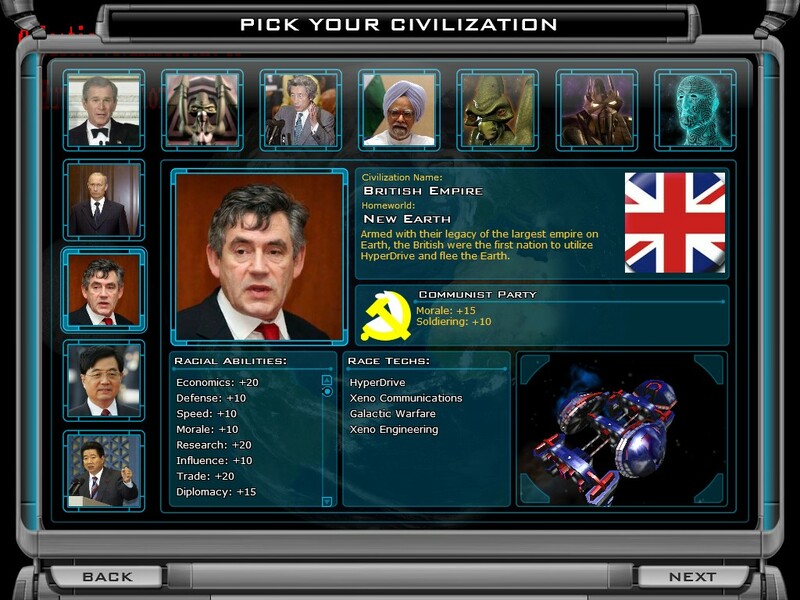 I figured that by the time we discover fusion power he has to be gone, and because I WON'T put David Cameron in and the Lib Dems don't stand a chance, I put Brown in. I'm most certinatly not a Conservative, I support Labour. I'm downloading it and checking it out just to see whats in it about "Liberlism" I see alot of pro-Republican Conservative BS in this mod. But I'll hold my judgements. Could you all post comments on the forum thread please and to Azrune, in strategy games everyone lives for centuries. Um, wouldn't the idiot leaders of today be dead by then? Nice Starlancer-ish idea- yet why the inconsistencies in chosing the leaders? May the unity of Terras warring tribes come sooner rather than later.